The New Orleans Saints are out in sunny California for the next couple of days as they will practice against and then play the L.A. Chargers in a nationally televised preseason game Saturday night. The practices begin noon central time so that’s when we can expect coverage to begin. Over the next few days here are a list of players and or battles that I think Saints fans should want to see positive stories on, tweets about or mentioned in post practice packages in local sportscasts. QB DREW BREES: Brees has had his work cut out for him this training camp against a stingy and opportunistic defense. Safety Marcus Williams is one a few secondary members that at times have made Brees snap off his chin strap angrily, clap his hands in disgust or utter very un-Brees-like language. Brees is working with a fairly young and inexperienced group and when you add three new potential pass catchers in Cam Meredith, Tre’Quan Smith and Ben Watson to the offense it’s going to take time on task to get a rhythm going. Brees hasn’t played in the first two preseason games and following last week’s performance under center it sure feels like it’s important for the Saints offense to have a solid scoring drive doesn’t it? Brees during a joint practice with the Patriots said at the time that at this point in his career he gets more out of joint workouts then in a game. I look for super competitive Brees this week as he tunes it up for the regular season. After Saturday night it’ll be September 9 before we seem him on a field in game action against. WR MICHAEL THOMAS: Thomas is a beast and has been ridiculous at camp. He may at times during the joint practices line up against All-Pro cornerback Casey Hayward. Thomas is also a L.A. native so there that added element. WR CAMERON MEREDITH: It had to be a special moment last week for Meredith who played in his first game since suffering a season ending knee injury last preseason. He was happy he said afterwards to get hit and get that out of the way. Meredith was only targeted once and it was on the opening drive when Hill fired a hot pass that went through his hands. The pass could have had some touch but no doubt receivers coach Curtis Johnson wasn’t hearing that as it’s a pass that needs to be caught. I’m giving Meredith a benefit of the doubt despite a few Colby Fleener comparisons already I’m seeing being made on social media. Meredith is still getting back to 100% health wise and players deal with the mental return to health differently. You’ve seen what he can bring at times. To me it’s about showing it consistently. I think this is a big week for him to show up in these practices and have at least 1-3 catches on Saturday night. RB BOSTON SCOTT: Scott in Jacksonville had one carry and almost a touchdown as he was stopped just shy of the goal line. The week leading into the Cardinals game the back politely shared with local media he’d enjoy a few more carries if coach Payton saw fit to provide and when they came last Friday he didn’t disappoint. Scott had 6 carries for 28 yards and once again did well in the return game with 3 returns for 87 yards. “He had two plays that stood out. I think that is the strength of his game right now and he is still working in the return area of it and he is still working within the framework of protection,” Payton said evaluating Scott’s game. “That’s something that he needs work on but he’s pretty good. He’s done a good job when we’ve handed him the ball and that’s kind of what we saw in college. I think he has good balance. I think he has good vision and good short area quickness. He can get to the edge pretty fast.” Let’s see if Scott is awarded more carries this Saturday. He could help his case by having solid practices on Wednesday and Thursday. The fact that Smith has seemed to earn the trust of Brees could make one remember Michael Thomas’s rookie season where it felt like at this point you could see the potential. “They’re different type receivers and yet I would say we are seeing the guy pick things up pretty quickly,” Payton says when comparing Thomas and Smith at this point in their rookie training camps. “So there are some similarities. I do feel like he’s having a good camp. We felt the same about Mike a couple years ago. The key is to keep giving him the reps at what we think he’s going to be doing in the game and reduce some of the variables. But he’s bright and he’s a big target. He can run. So he’s doing well.” Let’s see how he does this week. I don’t know about you but I’m looking forward to seeing his growth. SAINTS OFFENSIVE LINE VS CHARGERS DEFENSIVE LINE: The Saints trotted out their full healthy offensive line for the first time this season last Friday in the Cardinals game. The opening drives while ending in turnovers saw running backs Mark Ingram and Jonathan Williams gash the Cardinals on the ground. We’ve yet to see a good test in pass protection up to this point and that should change this week. “It’s a good pass-rush team, both of those guys, [Joey] Bosa and [Mark] Ingram played last night,” Payton said back on Sunday following practice about facing the Chargers pass rush. “We saw some of that game on TV, but those guys played really good football especially as the season went on last year. I think it’ll be good work for us.” How will the Saints beef fair against a solid Chargers defensive front and hold off key pass rushers when trying to throw the ball? MARCUS DAVENPORT: The rookie first round pick has been hampered by groin injury and has missed the first two-preseason games. With last week’s injury to Alex Okafor, it’s key for Davenport to start getting back on the field. “It’s just about the assignment. He’ll know he’s been at practice and in the meetings,” Payton said of Davenport’s road back to playing football. “It is just making sure he’s 100 percent. But I anticipate that happening this week. I anticipate him being able to work this week and receive some playing time.” Davenport has talent as at times this camp you’ve seen it, but it’s been brief. Terron Armstead has been providing daily humbling lessons and you can only learn so much in a classroom. Davenport needs snaps. This could be a big week for him if he is able to get back on the field and show up in the workouts and game. CB MARSHON LATTIMORE: Lattimore had two interceptions in the last full practice the team had and may have had another depending on video replay. Lattimore loves competition and last week spoke about the opportunity to face Pro-Bowl receiver Keenan Allen this week. This battle should be a fun one to watch. S MARCUS WILLIAMS: Williams has been the star of training camp for media in the local media covering camp daily. Williams has picked off Brees several times and seems to be at the right place at the right time. Can he make plays this week against Phillips Rivers? DT SHELDON RANKINS: Rankins said earlier in training camp that he left some plays on the field last season. This camp he’s shared first unit snap with David Onyemata as his progression has been solid. Rankins isn’t concerned about the rotation as he sees it as something that can keep the unit fresh. Still he told reporters he vowed to be better this season. Let’s see if he stands out this week. Posted in Who Dat's | Comments Off on PRACTICE? WE TALKING ABOUT PRACTICE? If Friday’s practice is any indication, that should work. The New Orleans Saints’ second-year safety broke up a pair of Drew Brees passes on back-to-back plays during full-team drills on the second day of training camp — again flashing the type of playmaking ability that he demonstrated throughout his breakout rookie season. But Williams knew that wasn’t what he would be asked about most after Friday’s practice. Thursday the preseason opener brings an end to the speculation and guessing part of how good the New Orleans Saints can be as it’s time to see what players can actually do in a game. 2017’s season has Saints fans excited, as excited as I’ve ever seen them not only in the Sean Payton era but also in franchise history. You’ve read and heard about how much talent and depth this team has over the past few weeks and months. All of that though comes without seeing a single meaningful snap and off of assumptions. I understand that preseason success and failure doesn’t determine and at times really give an indication of the season to come but it can shine a light on areas of promise or concern. A winning start is important for the Saints this season and in the past two seasons head coach Sean Payton has said winning mattered even in preseason. The open is against a team that is getting plenty of chatter nationally. Jacksonville was just as a surprise team in 2017 as the Saints were finishing the year 10-6 and winning the AFC South. The Jags in the post season beat Buffalo 10-6 in the Wild Card round, stunned the Steelers in Pittsburgh 45-42 and lost at New England in the AFC Championship game 24-20 in game in which they lead 17-10 entering the 4th quarter. NFL analysts across the county predict Jacksonville to have just as good a chance at having a good season led by a stout young defense and by LSU’s Leonard Fournette on offense who rushed for 1040 yards in his rookie season to go with 9 TDs. Head Coach Doug Marrone, a former Saints assistant under Payton, has gone about this year like last by putting his team though grueling training camp practices. I’m interested in seeing how the Saints stack up against a team that was a quarter away from the Super Bowl. I’m not talking starters against starters as I’m aware that many on both sides will wear ball caps instead of helmets but depth against depth. Kick off is set for 6p. The Saints have held 12 practices and you could argue the defense has won darn near all of the workouts, including Monday’s final practice of this game week. Whether it’s interceptions, pass blocks, strip fumbles, stuffing run plays, you name it as it seems as if the defense is doing the job. The plays being made also aren’t just from the starters but from players that this team will be looking at as key depth. I’ll be looking to see the Saints defense shows the flow and hats to the ball, show the ability to break up pass plays even after their caught but not fully completed. Lastly the team has not had a live period in practice so the game will be the first time to judge how well the tackling can be. Jacksonville’s offense is not a pass happy offense so it’ll be interesting to see if the defense can be physical at stopping the run. Let’s start by stating the obvious. Drew Brees gets injured to where he misses a handful of games or more this is not the same team. He’s a first ballot hall of fame quarterback. You don’t replace those. At best you deal with a loss like a damaged ship, keep it afloat and maybe even still manageable to stay in the fight. So that aside, there is a real possibility that a helmet malfunction, the flu, an injury during the game takes place and someone other then him needs to take a or a few snaps. Tom Savage and Taysom Hill are battling for the back up role. Savage has starting experience where as Hill doesn’t. Payton this week said that when comparing the two you have to start with the fact that they are two different quarterbacks. Hill is the more athletic. Savage the more manager of the two. Hill throws darts. Savage gets the ball there and you’re counting on making the right reads. Hill to me brings one other element that goes with his athleticism. The ability to extend or even make a play with his legs. In practice we’ve seen broken plays turn into runs down the field gaining big yardage. We have even seen college style read option plays where he kept and took it into the endzone. Payton has long talked about wanting an almost dual threat QB. Before you balk at the notion you need only take a look in the Saints own division. Carolina’s Cam Newton is that and won a league MVP. Philadelphia’s Caron Wentz is not just a pocket passer, nor is Jarod Goff with the Rams, Jimmy Garoppolo with the 49ers, Aaron Rodgers of the Packers all use their mobility. No one is saying that they are Michael Vick, but they are definitely stuck in stone in the pocket. With the potential the Saints defense has of keeping opposing offenses from putting up large amount of points and the potential the Saints offense has with young weapons at receiver and in the backfield, a quarterback needs to just not trip on the handoff. That’s Savage. Imagine if they have the ability to air it 50-70 yards down field on a dart on the run or elude a sack and find Kamara running out the backfield turning a sack into a first down and that’s what I think Hill can be. Now the deal is he has to go out and prove it. I still believe the Saints would like Hill to earn the job. He’s highly involved in special teams so he’s on the team. But Thursday will be his first chance his value is at quarterback and not slobber knocking returners on a punt or kickoff. Sean Payton’s given us what to look for when either Savage or Hill is in the game. Can the team in and out of a huddle?. Pace. Rhythm. Can they move the team up and down the field and produce points? Can they run the offense and make plays? If neither shows the ability to do so by game 3 of the preseason they’ll be on the phone calling someone that can. Mark Ingram missing the first four games has this position group as a must watch for four games. Your Contestants for a role while he is away in suspension land are Jonathan Williams, Terrance West, Shane Vareen, Boston Scott and Trey Edmunds. Edmunds has seen a move to fullback which could be an indication. I’ve found myself writing #32 a lot during practice and that’s Williams’s number. West has had a play here and there and I’m eager to see the quickness and stop on a dime then go ability Scott has shown at times. Game speed and live action will be the determining factor in determining who stays and who goes. Something to note is that Ingram can do it all, run, catch out the backfield and more importantly pass protect. Which of the back can do all three or at least two of the three? Payton has called these players the Bachelor contestant. They are Alvin Kamara, Ted Ginn, Boston Scott, Brandon Tate, Tommy Lee Lewis. Kamara is a we need a home run call up in the return game as he’s far too valuable to use. Ginn is right there. Lewis has flashed here and there as a receiver but it’ll be his ability to return the ball that will earn him a roster spot. Scott can earn his spot here in the return game. West, Vareen and Williams have experience over Scott as just running backs. Tate brought in after the start of camp after Payton admonished the other returners will be given a chance to earn it. WR TRE’QUAN SMITH #10: He has been one of the players of training camp that’s stood out. Smith has made plays since the start of camp that get you thinking uh oh did the Saints steal another playmaker in the third round? Smith has shown the ability to catch the ball smoothly, catch in traffic, catch it short take off and out run everyone. Smith has shown the ability to run on the snap, stop on a dime and make a big grab when the defense has the momentum and one of the plays of camp was his ability to go up and out jump a defender and bring the ball down and maintain it after he hits the ground. Can Smith do it in a game though? We’re about to find out and I have no question he will show what we’ve been seeing at practice. TE DAN ARNOLD #85: Tight end is a thin position group right now thanks to injury. Ben Watson is on the team as is Josh Hill. To me after that the spots are up for grabs. Arnold is a converted WR and honestly, the guy is just catching everything. Not flashy size or speed but just solid. CB JUSTIN HARDEE #34: The depth chart has Marshon Lattimore at RCB followed by rookie Natrell Jamerson and then Justin Hardee. Hardee a converted WR plays bigger then his 6-1 200 pound frame. He’s made some nice plays during practice and to me has some upside. Could a roster spot come down to Hardee and a draft pick? Payton’s gone with the better player in the past (Pierre Thomas vs Antonio Pittman). RB BOSTON SCOTT #30: He’s just fun to watch at times. Scott is one of the smaller players on the field but one of the quickest as well and has put some sick moves on some of the best Saints defensive players. I’ve mentioned several times at practice that because of when he’ll play in the preseason games and against maybe not so good defenders, I expect Scott to have a play or two that will wow and get people talking. I mentioned earlier up top, his ability in the return game can really help his chances at making the team. WR KEITH KIRKWOOD #18: Sometimes things happen to give you an opportunity and it sure feels like for Kirkwood it’s happening. Injuries to Travin Dural and Brandon Coleman have freed up snaps as those two are no longer with the team. At 6-3 210 the undrafted rookie free agent out of Temple is just consistently chugging along. Making a play here and there like Sunday at Tulane’s Yulman Stadium when he caught a pass from Brees in traffic in the endzone. Kirkwood has gotten snaps with the ones. Michael Thomas, Tre’Quan Smith, Cameron Meredith and Ted Ginn are your 4 locks at receiver. Who’s the fifth? Tate? Austin Carr? Kirkwood can help his cause with in game showings and special teams play. The Saints will have a brief closed practice on Friday afternoon before holding a pair of open practices over the weekend at the normal 8:50 to 11:40 schedule. Monday is a closed practice followed by a scheduled day off before the final open practice before preseason game number 2 Friday in the Dome against the Cardinals. What’s up Who Dat Nation !! come out and see former Saints WR Robert Meacham!!! He’s going to be the Guest of Honor Thursday at Sideline Pass Saints Watch Party / Back To School Saints Pizza Party! 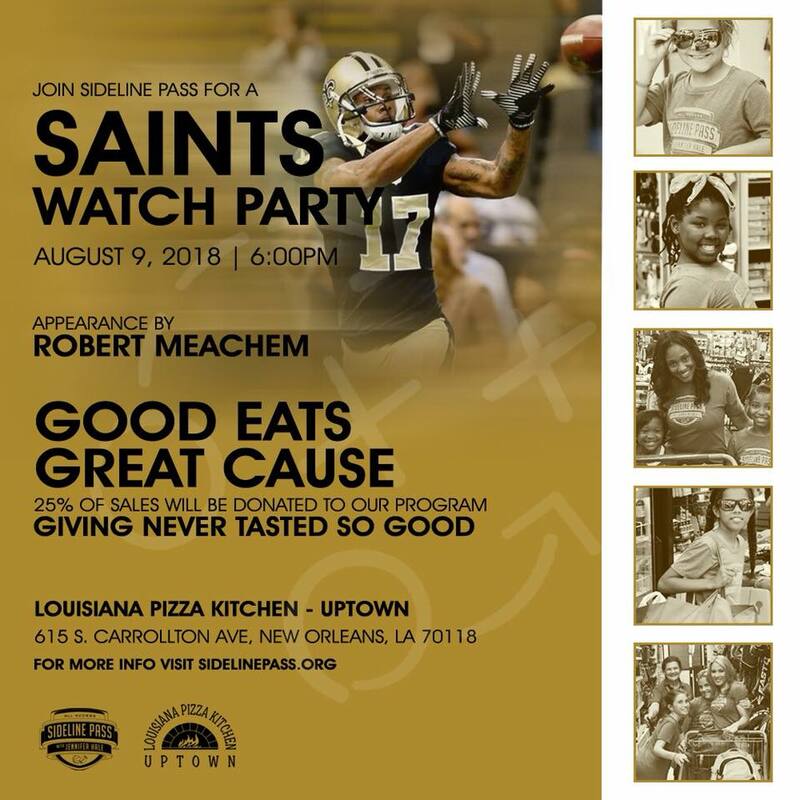 No ticket to buy… Just come meet Robert & watch the Saints’ 1st Game with us at Louisiana Pizza Kitchen Uptown! Louisiana Pizza Kitchen Uptown will donate 25% of whatever you spend to our efforts to take underprivileged female athletes shopping for their back to school sports shoes & equipment!! — at Louisiana Pizza Kitchen Uptown (LPK – Uptown). Just come eat, write “Sideline Pass” on your receipt & LPK will donate 25% of your purchase to our Back to School shopping trip for underprivileged female athletes!!! Cant make the watch party? That’s ok- go eat at LPK on Carrollton ANYTIME Thursday, August 9, write “Sideline Pass” on your receipt & we get 25% of your check! The Sports Hangover’s Gus Kattengell asks a few fans during a Saints training camp practice their thoughts on the team and the upcoming season. The Sports Hangover’s Gus Kattengell on Friday asked season ticket holders their thoughts on the upcoming 2018 season. There was one thing they all had in common. A combination of a potentially strong defense and potent offense has Who Dats thinking it could be a special season. The Saints have just three open practices, including Friday, before they take on the Jacksonville Jaguars in the preseason opener next Thursday. Friday and Saturday are normal 8:50-11:40 practices at Saints camp in Metairie but Sunday the team will travel uptown for a 7pm workout at Tulane’s Yulman Stadium. There’s not much of a debate as to which side of the ball has been the more dominant one thus far during camp. Defense. Pass break ups. Interceptions. Strip fumbles. Tip or batted balls you name it and the defense is doing it. Saints head coach Sean Payton said on Thursday that you want to see and ebb and flow where both sides alternate having good days and never want to see one side truly dominate. Thursday saw the offense get back to the form we are used to seeing. One with good temp and plays being made. Team periods were focused on redzone and goal line plays with a team period dedicated to running the football only in each area. RB Mark Ingra had a pair of nice runs as did a number of backs. Jonathan Williams is one the backs battling for snaps and at least to me I seem to be jotting down #32 a lot in my notes. It was easily one of the only practices that I can’t recall seeing Brees angrily pull off his chin strip or slap his hands together in disgust. A big reason Brees wasn’t disgusted much was because his accuracy was deadly Thursday. The best example was a goal line play with the ball spotted at the five yard line. The formation had two receivers to the left with Tommy Lee Lewis outside and Michael Thomas in the slot. At the snap, they cross with Lee running a slant towards the middle. CB Patrick Robinson is lined up over Thomas and Lattimore was lined up over Lewis but in a blink of an eye has Thomas fading to the near pylon and by the time he reacts it’s too late. The ball was already in the air and Thomas used his 6-3 body to go up and get it before Lattimore could react and brought down a ball thrown over his left shoulder away from Lattimore. It was money. If the Saints run that play 10 times this season there is no way it’s not a touchdown in at least 9 of them. Remember Sean Payton’s bachelor comment back on Sunday about how it’s anybody’s job at punt returner. Well we saw WR Austin Carr get a shot on Monday and Wednesday but with the signing of Brandon Tate, add him to the list of contestants. Head coach Sean Payton made it clear it was a big deal by spending Thursday’s punt and kick catching special teams drills right next to the returners. Like right next to them, blowing the whistle to start or stop the play. Just a little pressure huh? Saturday join Gus Kattengell, John Fourcade, Marlon Favorite, Bryan Bienemy and Jordan the Intern as they all head across the street after practice. New Orleans Harley Davidson is having FREE food and FREE beer. Burgers, hot dogs, chicken, sausage for the eats and cold beer, water and soda all for free for fans looking to refresh from practice. Sno-Balls and ic cream for the kids will be available as well. So come on by and talk football while you eat and drink for free! Monday the Saints will hold a closed practice and will be off on Tuesday. Wednesday following a walk through they will travel to Jacksonville. The Saints will kick off their preseason schedule on Thursday August 9 at Jacksonville.